SAN LUIS OBISPO: A motorcycle accident occurred yesterday in San Luis Obispo county on Vineyard Canyon Road east of Camp Roberts. According to CHP, the motorcycle rider was injured when his motorcycle ran off the road. No other vehicles were involved in the accident. The motorcycle rider was taken by helicopter to a San Francisco Bay Area hospital. No other details of the motorcycle accident are known at this time. 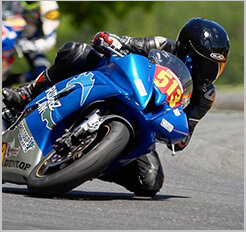 The San Francisco Bay Area motorcycle accident lawyers at Riderzlaw wish the rider a speedy recovery. A solo motorcycle accident like this can occur for many reasons beyond the rider’s control, such as road conditions or weather, but in many instances, solo accidents are entirely preventable. Proper motorcycle safety training, awareness of surroundings, and riding a motorcycle that is appropriate for experience level are important ways to prevent accidents. The vast majority of motorcycle accidents we see involve careless car drivers who aren’t paying attention and turn in front of or sideswipe a motorcycle. Too many times, however, we see accidents involving inexperienced riders on motorcycles that are too powerful for their skill level, or who are riding too fast for road conditions. Ride smart and ride safe. The motorcycle accident attorneys at Riderz Law are here for you if needed, but as fellow riders ourselves, we hope you never do.